The recent horrible tragedy of the bridge collapse in Minneapolis, Minnesota raises the question, and rightly so, of whether Georgia bridges are unsafe, also. More than 1,100 roadway bridges in Georgia are in such bad shape that they need renovation or rebuilding, state and federal records show. Another 1,800 Georgia bridges are considered functionally obsolete: They aren’t designed to meet new standards. Nearly 500 of the problem bridges are in metro Atlanta. But while one in five Georgia bridges are considered by the government to be structurally deficient or functionally obsolete, the state Department of Transportation says no roads now open to traffic are unsafe for the vehicles that travel them. How can this be? Can Georgia citizens rely on what the Georgia DOT is telling us about the safety of our bridges? Or does Georgia have to experience something as utterly horrible and tragic as the Minneapolis bridge collapse before we get the Georgia DOT’s attention that something needs to be done to make Georgia bridges safe? And I don’t mean “safer”: I mean simply “safe.” Remember, this is the same Georgia DOT who immediately proclaimed nothing was wrong with its left-hand exit from I-75 at Northside Drive after the bus carrying the Bluffton, Ohio baseball team accidently drove up this exit and crashed off the overhead pass when the driver at last realized it was not the continuation of the bus lane on I-75. Georgia citizens deserve better. I hope that the Georgia Legislature will act during the next General Assembly in 2008 to require the Georgia DOT to revamp their bridge “inspection” procedures and to require better maintenance of our Georgia bridges. The loss of one precious life in Georgia is too steep a price to pay to allow the Georgia DOT to remain careless and clueless about the situation. 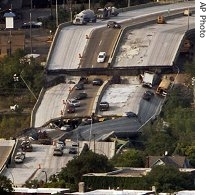 After the bridge collapse in Minneapolis, Minnesota State Legislators immediately called for better inspection procedures of all bridges. Our Georgia Legislator should do likewise.